More often than not, you will find bars that are fancy and modern or they’re called a lounge instead of a bar. This is certainly the case in the south part of Antwerp. Here it can be hard to find a good, no-nonsense pub, locally called ‘bruin kroeg’ (literally ‘brown pub’) because of the dark, typical interior. 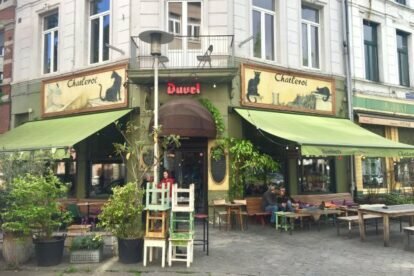 These type of bars are slowly fading away from Antwerp. ‘Chatleroi’ (‘Chat Le Roi’ means ‘Cat the king’) is one of the exceptions where no nonsense is key and brown is still the main color. The walls are decorated with old posters and the beautiful bar is an eye-catcher. You will get the best atmosphere the closer the days gets to the weekend. Order a drink and install yourself in the old Chesterfield on a lazy afternoon. You will find a few people minding their own business, reading the newspaper and drinking a coffee. If the sun is out, grab a seat on one of the benches outside, right next to the smoking lady – smoking cigarettes, that is! When the evening falls, Chatleroi naturally transforms into a crowded pub full of locals. You might even spot a famous Antwerp actor or singer here, like Tom Barman maybe? The music gets louder and from time to time there is a live band playing some jazz. The later into the evening, the more people will spontaneously start dancing. Don’t be shy, join the fun!